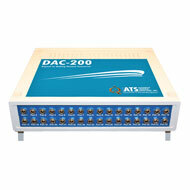 The DAC-200™ is a digital-to-analog converter designed to convert the output of the ATVS family of instruments to 0-5VDC. The device produces an output whereby the voltage is linearly proportional to both the air velocity and temperature for the ATVS product family, including the ATVS-Nxt™, ATVS-2020™, eATVS-4™, eATVS-8™, and iQ-200™. Two USB ports connect the ATVS-2020™ or eATVS-4/8™ and the DAC-200™ to a computer. This product is capable of outputting 32 signals from 32 sensors of the ATVS-2020-32 system. The DAC-200™ is operated by stageDAC™ software, which enables the user to specify which outputs are velocity or temperature through the software’s GUI. The unit can also be used as a general purpose digital-to-analog output converter. A LabVIEW™ VI (DAC-200™) is provided to facilitate programming this device in a LabVIEW environment. The availability of an analog signal is essential in many industrial applications and control systems. The DAC-200™ plays a critical role in proving a 0-5VDC signal for such application where air velocity and temperature are measured. Furthermore, since the voltage output is linearly proportional to the air velocity and temperature, use of any data acquisition system with an ATVS product family is now made possible by the DAC-200™. Additionally, the DAC-200™ can convert flows in the range of 0-50 m/s, 0-25 m/s and 0-10 m/s to linear voltage and temperatures from -10ºC to 90ºC to linear output voltage. Other ranges are available upon request.